What does “straight run” mean? 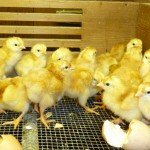 A straight run of chicks simply means that we sell them to you as-hatched, with no attempt made to separate out or distinguish males or females. We do not employ a sexor (someone who is able to determine at hatch time which chicks are males and which are females), so all of our chick sales are straight run only. Please note that this does not mean that you’ll get an exact 50-50 split, particularly if you order a small number of chicks. If you order 10 chicks, for example, there is still about a one-in-five-hundred chance that they’ll all be males or all be females. But generally, for larger orders, you’ll find a mixture of both males and females. We make no guarantee with our orders as to how many males or females you will end up with.